Brandeis still has an outside shot to make the NCAA tourney with that record. They have no conference tournament, so they'll move up the rankings a little with losses from teams above them. Plus, if the teams above them all get automatic bids, they'll be on the table for Pool C selection early, where their OWP and OOWP numbers will look really good. They've got a strong team and they've been playing better of late. If Brandeis goes 17-8 and the conference leaders all win conferences, there would still be 4 teams ahead in the reg poll if I am correct. Now I believe BSC lost to SSC so they may fall some and after what happened to UMD falling so far & WPI leaping so far I guess Brandeis could end up anywhere. I'll say this after seeing Brandeis vs Emory, if they get in tourney they could be a real problem for teams especially with good matchups. I assume if they get in they will play a higher seed based on record and they could upset top teams(not sure it would really be an upset). They have some brute forwards in terms of bulk/strength.Their 3pt shooting is ridiculous(not last night but based on season stats) so they can space court to get to forwards inside. Some teams in NE and E regions are hoping they lose one of last two. There would be 4 ahead of them if the poll doesnt change, but since UNE already lost and I think they will evntually end up ranked higher than Amherst (Brandeis has the head-to-head and much higher OWP), Brandeis could feasibly be ranked 2nd or 3rd in region at the end of the season(depending on what Salem State does) if the teams ahead of them hold their conference tourneys (WPI, Middlebury, UMD or RIC, and Bridgewater). Elms already has a lock on a Pool B bid. If nothing else, Brandeis might end up dragging CMU out of the tourney with them, because Brandeis swept the season series 2-0 versus CMU (CMU now has 5 region losses in the great lakes, 2 to WashU, 2 to Brandeis, and 1 to Case Western, plus their loss to Richard Stockton). So the first round matchups (assuming I am correct, but thats not a given) will be MIT hosting CGA, Wheaton hosting Babson, and Springfield hosting Clark. Winner of Springfield/Clark will play WPI in the semis and the winner of MIT/CGA will play the winner of Wheaton/Babson in the other Semi. hugenerd, the official NEWMAC web site concurs. Should be a fun tourney. What are the odds of WPI losing the tourney this year? Slim to none, 50/50 . or very possible? Seems like they are playing some good def and getting good off production. Also, anyone know that site that had projections of teams in the tourney and first round matchups. Im not sure of the site, you might want to check some of the multiregional boards a few weeks back. I would say WPI is the favorite, but by how much, I think it matters on a bunch of things. Obviously they are hosting and that will help them. I think there are other teams with a good shot, but no other team is as deep as them (so other teams are much more susceptible to things like foul trouble). They will be in the tourney regardless. I agree with your assessment of WPI's depth My wife is a graduate of Babson and a breast cancer survivor. We went to the Babson-WPI game on Saturday. It was senior day at Babson at as well as their Pink Zone event to raise money for cancer research. We were glad to attend and donate some money to a very, very worthy casue! This was also a chance to watch the brothers' Etten battle each other. Zach Etten (according to the annoucer, he is the #13 all-time scorer at Babson) scored 10 in his final regular season game at Babson, but struggled shooting only 3 for 12. WPI's defense was extremely impressive with rentless pressure from tip off til the final seconds. This was much, much more intense than the other times I saw them play. They do have depth that I had not seen in the other outings I had been to. Their #1 big man, Lessard, did not play. I am not sure why not, but my guess would be illness. The other big man (6'7") they carry, Carr, played quite well. He has not played much and wears a knee brace. My understanding from asking a WPI supporter is that he had a knee injury last year. It certainly didn't seem to bother him at all. He neutralized any attempt Babson tried at a low post game when he was in the game and he was, as the case was for ALL the WPI players, defending all over the court. The offensive star of this game was another WPI freshman, Fernando Perez. I had to check the box score when I got home to be sure, but he did put up a double-double with 19 points & 11 bounds. He has a real nose for the ball. He is undersized, but makes the most of what he has. They also got a fine offensive outting from Jeff Robinson who hit 5 of 7 shots for 13 points. I dont see anyone beating them in the conference tournament if they play this kind of defense. Babson had very, very few uncontested shots. Ben Etten played a tremendous defensive game as did others who at times guarded his brother. Even the 3's were being strongly challenged as Babson made one of only 8 attempts! They average 13 attempts per game. Coach Bartley just kept tosssing fresh bodies at them the entire game. I did notice in the write up on the game, that this WPI senior class has set the standard for a 4-yr career in the NEWMAC. A 42-6 record over their four years. That is a great feat in any conference. My bet is WPI really wants to see Clark in the semi-finals to avenge their only conference loss. Definitely a worthy cause. My mom is a survivor also. I look forward to the tourney. I think MIT has a chance if they can get by CGA. They have the two best scorers in the league this year (in NEWMAC play) and they have a few other guys who are very capable of making shots. If they shoot like they have in the past and their big 2 stay out of foul trouble, MIT has a good chance against anyone. In their first loss to WPI, Bartolotta had 4 fouls in the first half and he didnt play in the second game. If he stays out of foul trouble like he usually does, Johnson's shot is falling like against Clark, and Gampel is taking care of the ball, I like their chances. WPI re-enters the rankings at 23 this week. The team you have to mention is Coast Guard. 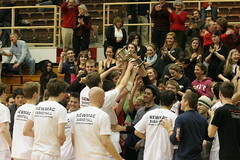 They've won the last 2 NEWMAC tournaments (both at WPI). Two years ago, they won it coming from the last seed, having gone 2-10 in the NEWMAC that year. CGA still has one of the academy's all time players in Craig Johnson. I don't see how that roster finished last in the league this year myself. I believe WPI has been the first seed for 6 straight years, and their only losses in the last 4 tournaments were the 2 recent games to CGA. Those two Coast Guard teams have a significant difference from this one. This team does not have Al Sowers, Grant Johnson, Jeff Prebeck & Steve Blum! Those four players were the key comonents to the two NEWMAC tournament wins over WPI. I fully agree with Hugenerd. MIT offers the most significant challenge. I think a WPI/MIT title game would be interesting on virtually level. Best player in the league trying to get to the NCAA's, WPI's speed & depth Vs the top two scorers in the conference & perhaps the most critical is MIT's ability to handle WPI's pressure defense. As he said, there are some big "ifs" that all have to break the right way for MIT to win. That said, the MIT/CGA game tomorrow should be a great game as well. I hope to be near a computer to follow the game.